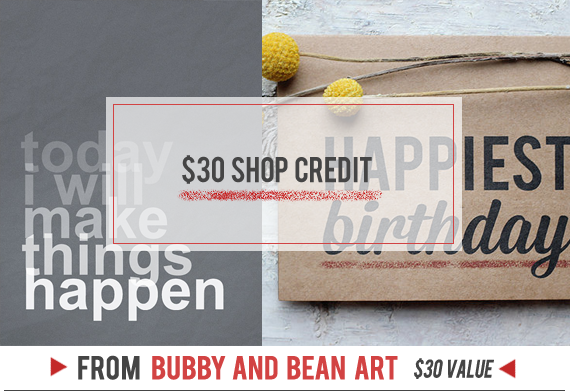 Bubby and Bean ::: Living Creatively: BIG JULY GIVEAWAY // Win a $240 Prize Package! 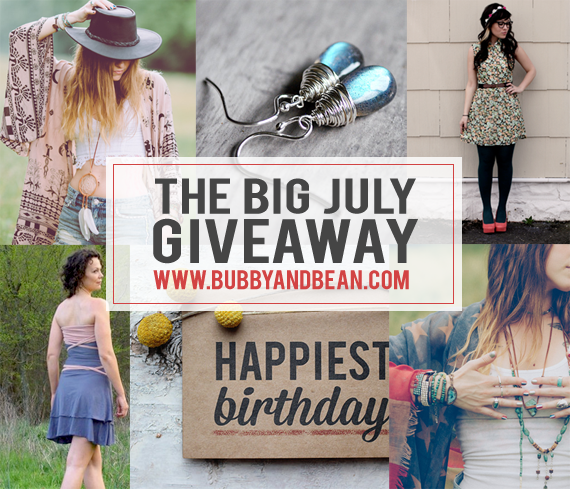 BIG JULY GIVEAWAY // Win a $240 Prize Package! Happy Friday! July is my favorite month of the year, so I'm especially excited for this month's big group giveaway. 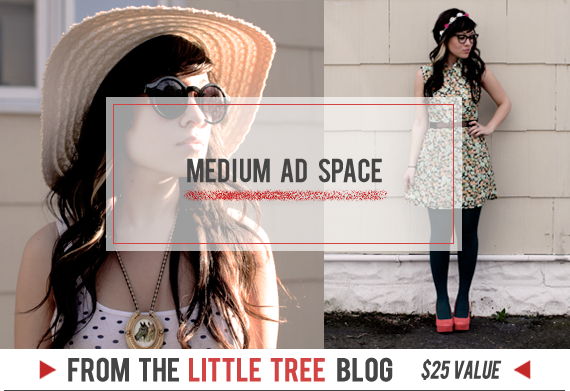 I've teamed up with several of July's large and medium sponsors to put together an amazing prize package of goodies that includes gorgeous handmade jewelry and clothing, paper goods, shop credits, and blog ad space. All together, it's valued at $240 - and one lucky Bubby and Bean reader is going win it all! This giveaway is open to Bubby and Bean followers/subscribers. If you're a new reader, please make sure to subscribe first through GFC, Bloglovin', or email in order for your entry to count. To enter, just leave a comment telling me your favorite summer food! Visit any of the shops from this giveaway (Starletta Designs // Gaia Conceptions // SoulMakes // Little Tree Vintage // Bubby and Bean Art) and list your favorite item(s). Favorite any of the Etsy shops from this giveaway (Starletta Designs // Little Tree Vintage // Bubby and Bean Art). This giveaway goes through July 25th and is open to Bubby and Bean readers worldwide. The winner's name will be chosen randomly and announced shortly after. Please make sure that you check back and/or that there is a way to contact you if you won. Thanks again to our July sponsors for contributing such great prizes! Good luck! I follow SoulMakes on GFC as Denisa. I favorite BubbyAndBean on Etsy. I liked Bubby & Bean on Facebook as Denisa Ivascu. Toss up: watermelon and heirloom tomatoes! I am all about the pluots in the summer! So many levels of fruity-lishness! My favorite summer food is beer! Does that count? Haha. I also LOVE strawberries and corn on the cob! hmmm summer food. I love all the berries and figs that are in season. ooo and peaches-it's all so amazing! My favorite summer food is watermelon! My favorite summer food is BBQ chicken. I clicked the like button! I follow via blogger! My favorite summer food has to be watermelon! I follow BubbyandBean on IG my name is GypsyTentSister! I follow you on Twitter I'm thevegangypsy! and lastly, I liked this post above on facebook <3 thank you for this amazing July giveaway!! <3 I love this month! Favorite summer food.... tomato mozzarella salad! My favorite summer food is sweet corn on the cob! It should be ready any day! 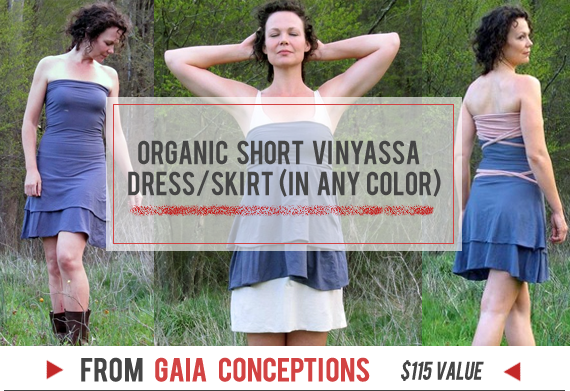 Love this cocoon shirt from Gaia Conceptions! This Feather Child Necklace from Soul Makes is beautiful! Best summertime food is Mediterranean cuisine!! I absolutely love hummus, pita, tabuli, with falafel!!! Great with an iced tea and lemon! Its refreshing and light!! I would love to win! My favourite summer foods are corn on the cob and watermelon. I love grilled corn on the cob with curry lemon butter sauce on top. So good! My favorite summer food is lemon bars! My favorite item from Starletta is the Sterling Silver Pink Moonstone necklace. My favorite item from Gaia Conceptions is The Obi Shirt. My favorite item from SoulMakes is the Suspended Quartz Necklace. My favorite item from Little Tree Vintage is the Vintage Tapestry Wallet Clutch. Following Little Tree on GFC. My favorite summer food is watermelon. I favorited all 3 Etsy shops. my favourite summer food has to be strawberries and cream! I Tweeted using the magic words @lfrobom. My favourite summer food is fresh fruits! I Just followed all your blogs on pinterest. My favorite summer food is salad in many varieties mostly comprised of fresh fruit, light cheese and crisp nuts. Thank you for hosting this giveaway. I have lots of favorites, but there is one I always crave it is fruit salad. 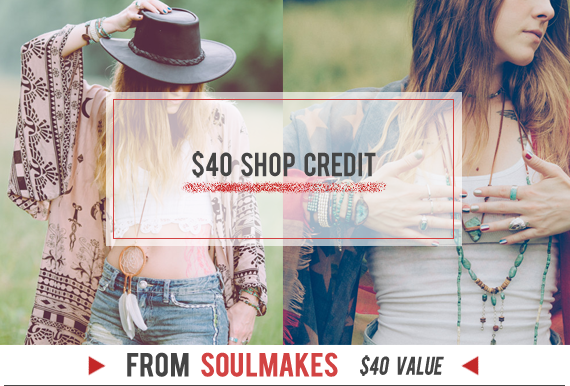 From soul makes my favorite is gypsy stone necklace. I follow Little Tree for some time now. I follow Bubby and Bean. I follow Bubby and Bean on facebook for a long time now and I love it. I follow Bubby and Bean on Pintrest. I already follow Little Tree via GFC. Chicken off the grill is my favorite summer food! I follow on Pinterest (username @justByou). I follow you on twitter (@shopjustByou). i love the raspberry sorbet my d-i=l makes! ps, I went to favorite it, and it was already favorited from the last time I was by! Favorite Summer Food: Spicy Mac 'n' Cheese..! :)) Yummmm! White Pearl Necklace..! :)) SO cute! I'm in loveeeeee with the Belted Cocoon Jacket..!!!! Fave summer-time food: Barbecue pulled-pork -- yum! My favorite summertime food is hands down Ceviche. I follow your blog on instagram. Watermelon! !1 There's nothing that screams summer like watermelon...oh and raspberries! Straight off the plant and into (my mouth) the bucket. 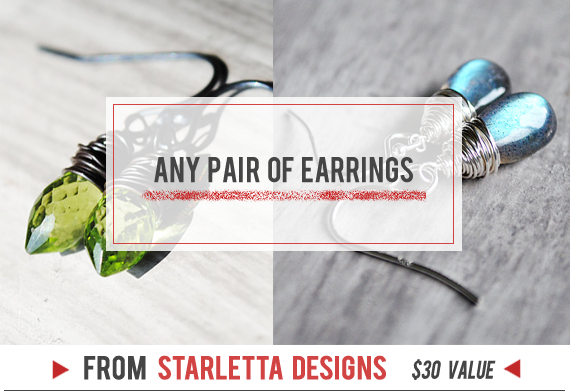 And from the soulmakes the dress will be perfect with the tribal breastplate..
My favorite Starletta Designs item is the Labradorite Silver Earrings Sterling Gemstones Wire Wrapped! <3 They're beautiful! My favorite Summer food is Sorbet! Following Starletta and Little Tree on twitter! My favorite summer food is blackberries!